At first look, this beauty evokes memories of the ’50s and all the trappings that come along: Poodle skirts, Pompadour and Duck-Tail hairstyles, rolled-cuff jeans, Drive-Ins, and George-Barris-style custom cars. 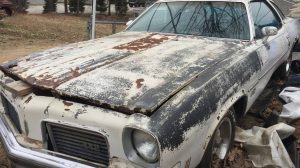 This car just happens to be available here on Craigslist in the Philadelphia Western suburbs, and it would cost a LOT more to build it today than the $22,000 asking price. Sporting all of the classic exterior touches, like the chopped roof, Lake Pipes, ’58 Lincoln headlights, “frenched” taillights and antenna, ’54 DeSoto grille, hand-painted stripes at front and rear, dual spotlights, and wide whitewalls with moon-style hubcaps, it almost looks like it was done by Barris himself. Inside and under the hood. we see much more modern and reliable running gear, and creature comforts that many antique-owners would love to have. 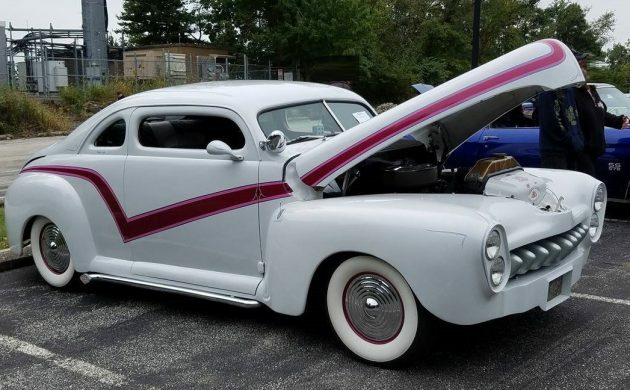 The seller says that they are “…getting too old to enjoy it…” but with plush bucket seats, A/C, heat, wipers, power steering, tilt wheel, and Ford 302 mated to C4 automatic transmission, turning a Ford 8″ rear, we can’t imagine a more enjoyable customized ’47 Ford Deluxe. 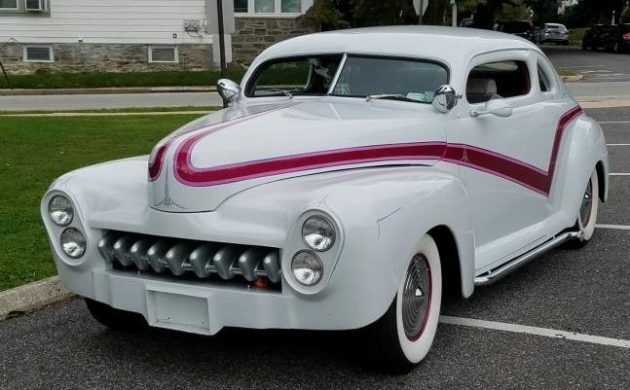 In case you’re wondering what a stock-exterior ’47 Ford looks like, our own Jeff Bennett found and wrote a nice piece on this ex-moonshine-runner a while back. This car is truly one-of-a-kind and, with all the work done, it’s a turn-key head-turner that can be appreciated by old and young alike. Is it me, or is this an incredible deal? I don’t typically go for this kind of build, but it seems like a good value to me. I do wonder why almost every custom I see has an automatic though…. I’m not sure if this is an incredible deal, still a lot of cash, but I think, the less cheery thought, is nobody wants these cars anymore. Once the epitome of customs ( I built a plastic model of this car once) interest is fading for these. Re: automatic. I think when building a custom car, it’s just a lot easier to run an automatic, rather than clutch set, etc. Plus, automatics widen your appeal, if any today. 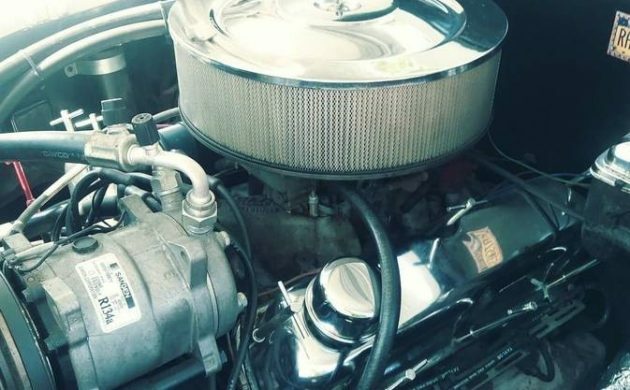 On the question of automatics: back in my teens some friends and I had the brilliant idea of stuffing an early (Desoto I think) Hemi into a 55 Chevy with a blown engine. There were no adapter kits, it was all ‘Heat Wrench’, saws and steel. Luckily one of the guy’s uncles had a junkyard so we had parts along with access to a machine shop so we used what we had available. You have no idea how many headaches trying to rig a mechanical clutch linkage between two mismatched components (long before the days of hydraulic clutch parts were available). We eventually went with an automatic as we just could not make a clutch work. I’m not claiming it was good or elegant, actually it was more a deathtrap on wheels. 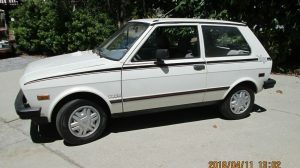 It took a long time (I was told by another friend) to get that thing so it was safe to even drive, and it was planned as a drag car from the gitgo. Never was that dependable during my involvement but it sure was fun frying tires (isn’t that the most important thing to teenagers?). Went into the Army after that and lost track of the friend and the car. i can really appreciate the work that goes into such a car. Love to look at them and when I think about having one I remember a fellow I knew. He was a CEO of a famous company. 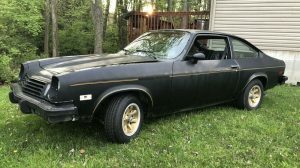 When he was a kid he was a hot rodder and built them himself. As a CEO he had no time and lots of money. He commissioned a custom from a very reputable shop. They did a fantastic job. Problem was that because it was a one off there were all sorts of little things that went wrong that no one anticipated. Last one was a braided steel brake line rubbed through a spot and when going over an unseen speed bump too fast some wire touched the brake line and shorted out one of the modules. He and his wife were planning a nice night out and ended up in a taxi. After that he had the same shop restore a convertible continental to 100% stock. After a couple of teething problems the car ran perfectly. Customs are nice to look at and take to meets. I like to drive mine so I’ll stick with what the engineers worked ku the bugs on with some time tested improvements. Like the article says it would be almost impossible to build for this amount. It’s great, love it, wish I could buy it! I would buy this if I had the spare cash. It’s really interesting. Sorry folks I’m a purist. The LORD has blessed me with the means to purchase anything I desire. But I’m afraid I’d pass on this one. Well, it couldn´t be a better example! As Howard A says, this is pure 1960s AMT. I couldn´t live with it, but it should be in a lifestyle museum somewhere. The “Hub Caps” (i.e., the wheel covers) are “Ripple Discs. I don’t understand why so many hot rods, no matter the make, use SBC drive trains. With a ford, the distributor is in the front. Less firewall modification. Big block Chrysler, same scenario. Any input? 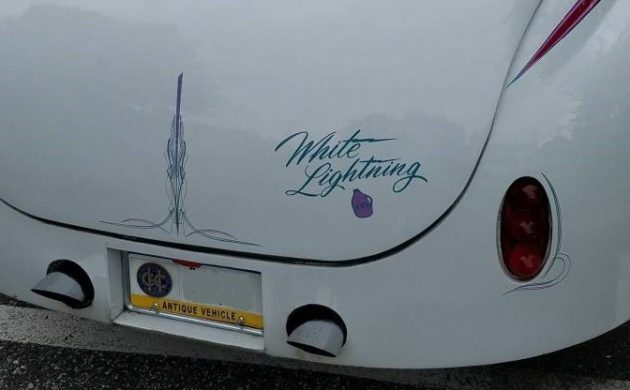 Oh, I love this type of hot rod. The SBF is longer. Therefore firewall mods are required. The Ford also has a front sump oil pan. 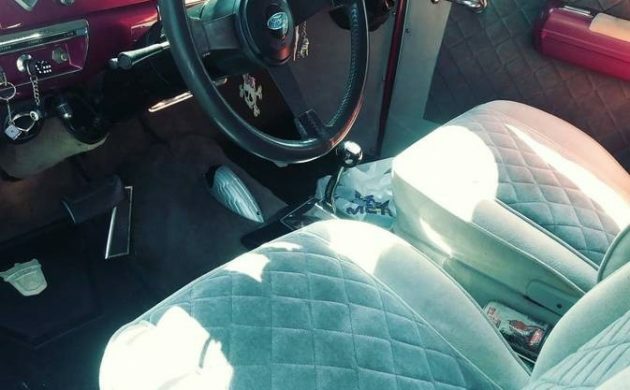 A Bronco pan is rear sump, but it still is deeper in the front than a SBC and that can cause issues with cross member clearance. Ford also changed bell housing bolt patterns throughout the years, making rounding up the right parts a challenge at times. With a couple of adapters the SBC is a bolt in replacement for a Flathead Ford . Owner says “too old to enjoy it”. That’s exactly the reason early postwar era cars are plummeting in value. The market is becoming flooded with cars like this and restored original ones alike. It’s sad but it’s truly the end of an era. People need to realize the collector car market is changing very quickly. This appears to be a scam. I had planned to purchase the car if it was reasonably as represented in the Craigslist add. The telephone number given is not functioning and there is no email response. Hopefully, I will not be receiving a bunch of scam calls now on my cell. 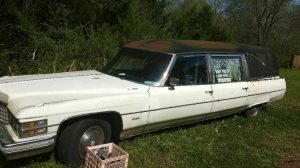 I tried to purchase another car I saw on barn finds 3 months ago with a Craigslist ad. It was a scam, also.